Clearly we need to track down that 1% and make them happy. “According to our study, 99 percent of TCG employees say it is a great workplace,” according to Sarah Lewis-Kulin, Great Place to Work’s Senior Editor. TCG, Inc employees completed 83 surveys, resulting in a 90 percent confidence level and a margin of error of ± 4.15. 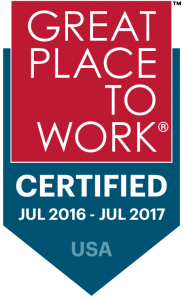 To see how TCG compares to other businesses, please visit the Great Place to Work website.